So this morning I’m reading a diary on the Great Orange Satan about political doings over in Bagdad By The Bay. Though I grew up in the San Francisco area, I’m not really current on what’s happening, aside from the fact that I couldn’t afford a shack in SF itself anymore — notamidst all those Twitter-, Apple-, and Google-erati. So I gobble down the story, assume/accept the big-city, big-money corruption narrative, and move on. I do have friends and relatives back by the Bay, as it turns out, and one of them has worked in city government for a long time. He’s got first hand knowledge of San Francisco’s allegedly lost progressive mindset as it works within local government, and he weighed in. I’ll excerpt his comment below, but first I just want to say this was an object lesson for me, a reminder of how easy it is trip up in the way that I’ve criticized some of the most extreme of the Bernie camp for doing. That is: there’s a ton wrong with our politics, our society, and our engagement with each other. It’s so tempting to leap from a clear problem — the impact on middle and low income residents of the gentrification of San Francisco (and elsewhere!) driven by extreme income inequality — and assume that political actors are obviously complicit. The reality? Sometimes they are, sometimes they aren’t, and it takes some effort to figure out the five Ws and the H in each case. Worse yet — if the problem is truly complex, then political action is at best an incomplete tool to deal with the issue. Which is why, in the end, I think Obama is a truly great president: he gets all of that. The need for policy and politics; the insufficiency of politics on its own; the agonizing difficulty of addressing any truly major problem — which translates into rage-inducing slowness to see the change take shape; and the need to keep plugging away. I feel that rage often enough, and I know that I don’t have the qualities of character our president does, the off-the-charts focus and persistence required to make sh*t happen, and to wait — years if necessary, decades — to see the results. I have high hopes for Hillary on this score. Not that I’ll agree with her on everything — I don’t and won’t, just as I haven’t always with Barack Hussein Obama. But I trust her (yes, that word) to pay attention, to know her stuff, to hire good, smart folks, and to soldier on and on and on — as the job and the world requires. I’ve worked on the financial administration side for the City of San Francisco for many years, and the truth is that under successive mayors and Boards, San Francisco has put more money behind progressive goals than almost any other city in the country. The City spends billions of dollars a year on its amazing public health programs, including a universal health access program for City residents that predates and goes well beyond Obamacare, and many hundreds of millions of dollars on programs to help the poor and homeless, including thousands of units of housing for the poorest of the poor and people with severe mental illness and other health problems. The City spends hundreds of millions a year subsidizing its transit system and setting aside funds for children. The City spends hundreds of millions a year subsidizing its transit system and setting aside funds for children. These are great progressive achievements…. You can read more at the link. The writer goes on to acknowledge that despite all this, the reality is that San Francisco’s housing costs put enormous stress on too many, and argues that the drivers of that are at best barely subject to direct political control — and that policy responses offer very tricky alternatives. The challenge for progressives, among whom he numbers himself is thus to..
examine what housing policies we should we be pushing for that can help the most people of different income levels that need housing (not just the poorest of the poor). TL:DR: electioneering — and definitely punditizing — is easy. Governating is damn hard, which is something to be mindful of at this and every season. 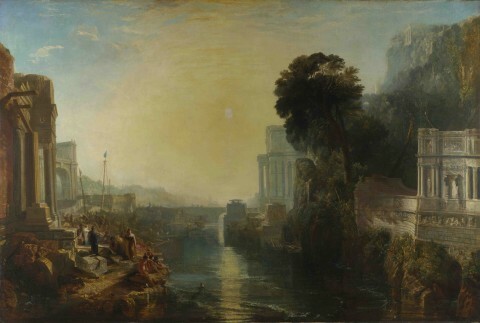 Image: J. W. M. Turner, Dido Building Carthage, 1815. This entry was posted on May 25, 2016 at 2:37 pm and is filed under good writing, Policy, Politics. You can subscribe via RSS 2.0 feed to this post's comments.